At FiveStars, we have biweekly all-hands town hall meetings. There, Victor Ho, the CEO, recently proposed to do a fun activity: 10 people from the company are randomly picked at each meeting, and they have to briefly explain what they are working on now to everyone. I understand some people's talk very well while I don't on the talks of others. What makes one's explanation more comprehensive than others? I will take examples from software engineers' talk in the post, but the big picture is applicable to any expert-to-non-expert talk. It seems the challenge is harder for engineers. The audiences just clap hands, whistling, basically saying, "Well done, speaking something. ", or just paint a big question mark on their faces. Is it because engineers are socially awkward? Is it because what they do is too complex for general audience to understand? I don't think those are the case. In essence, this is an issue of missed focus by the speaker. Let me explain. The objective of software engineering is business automation. We put the tasks, which are done repeatedly and manually otherwise, into a magic black box so we can forget about it and get the benefits at scale. When we talk about this black box, most audience wants to know what it does (outside the black box). 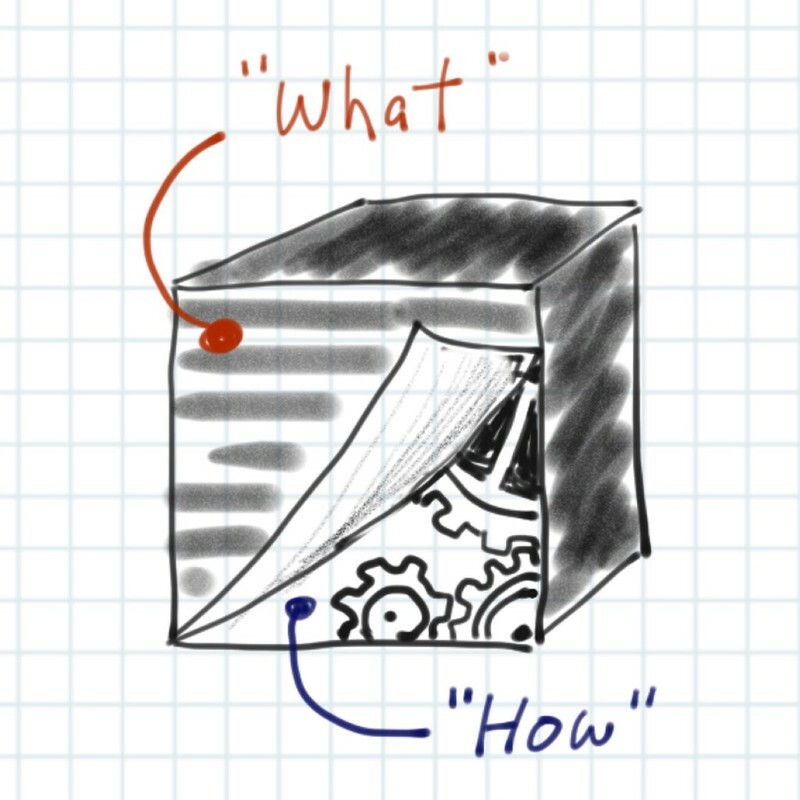 But engineers, who created it or about to create, want to shift everyone's focus immediately on how it does (inside the black box). Of course, it is often good also to discuss how the black box actually works. It's wrong to assume non-experts aren't interested in knowing the process. However, staying at an appropriate level of details seems to be another challenge. Engineers build things bottom up, piece by piece. In software, we always want to the cutting-edge technologies that always come with an exotic name. 2 Result? "...so, we cache this info at Redis, and...oh, Redis is what we use for key-value cache store, and..."
"What do you mean by cash and key value store?" We get stuck in describing low level items in detail while the listener don't even remember why we are talking about this anymore. It's as if we are lost in the forest while climbing to the summit. Human brain seems to use symbols to pack a big amount of information such as complex process. Once the symbol is registered in our brain, we can focus on high level items to think faster. Think of the case that we often say, "google it". When everyone uses Google, that makes sense, but we tend to forget that something familiar to us may be completely new and strange thing to others. In the above example, we could have just told the audience that it takes time to calculate the result, so we make computer remember the result at the first calculation in case we need the same information again in the future. Only after audience understands that, we can put a short-hand "Redis" on top it to revisit the idea efficiently in the rest of the discussion. Talk about the purpose (what is it?) and benefits (so what?) first. Keep the description of process (how does it do?) at high level. Convert symbols and shortcuts (i.e. technical jargons) into plain English. After all, it boils down to the golden rule of public speaking: Know your audience. I'd add to this golden rule by saying, "Know thyself" (or know your tendency as an expert). We all should take a moment to think about this rule, and make our own actionable practices. That way, an expert can also be an effective communicator, be it at a small group discussion or at a conference scale talk.